Our Third Museum Symposium will be held on Saturday, April 11th, 2015 in Marjorie Fisher Hall (Gilman 50). Dr. Beverly Wendland, James W. Knapp Dean of the Krieger School of Arts and Sciences, and Dr. Joel Schildbach, Vice Dean for Undergraduate Education at the Krieger School of Arts and Sciences, will both make remarks at the event. Throughout the day, we will hear from undergraduate and graduate students as well a faculty working on objects from the Archaeological Museum collection. A full schedule of talks can be found below. After the student papers, all attendees are invited to the museum to view an exhibition of contemporary drawings inspired by objects in the museum collection, and to see new student exhibitions. This will be followed by a reception in Gilman atrium. All members of the Johns Hopkins community as well as members of the public are cordially invited to attend. For those who cannot attend in person, digital video of the talks will be posted on our website in June. 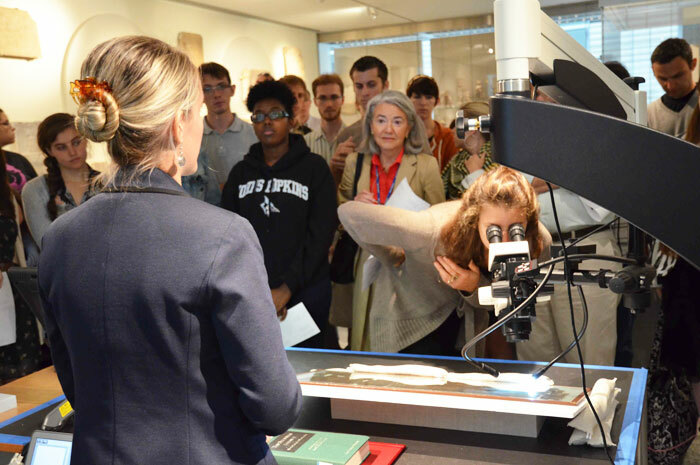 To view videos of student papers delivered at the Second Museum Symposium in 2013, please visit the 2013 Symposium page on our website. Please note that this schedule is tentative and may change slightly closer to the event.